Back when I was growing up, cookie cakes came in one form – a single layer sheet cake. But why not turn a cookie cake into a layer cake? So when my six-year old daughter requested oatmeal cookies for dessert, I thought I’d turn the humble oatmeal cookie into a fancy layer cake. Because I’m a purist when it comes to oatmeal cookies, I don’t like adding any raisins, chocolate, or nuts to the cookie itself. But I couldn’t resist adding some dark chocolate ganache to top off the cake. The reason I chose a chocolate with at least 70% cocoa for the ganache was to balance the sweetness of the cinnamon frosting. It turned out pretty darn good! Seriously, who could resist eating six thin layers of chewy oatmeal cookies with a fluffy cinnamon frosting sandwiched between each layer? Not me, that’s for sure! And apparently my friends and family are in the same boat because this delicious oatmeal cookie layer cake with cinnamon frosting was devoured. I was hoping there would be at least some leftover that I could sneak for breakfast the next morning. Unfortunately, there were only crumbs left! 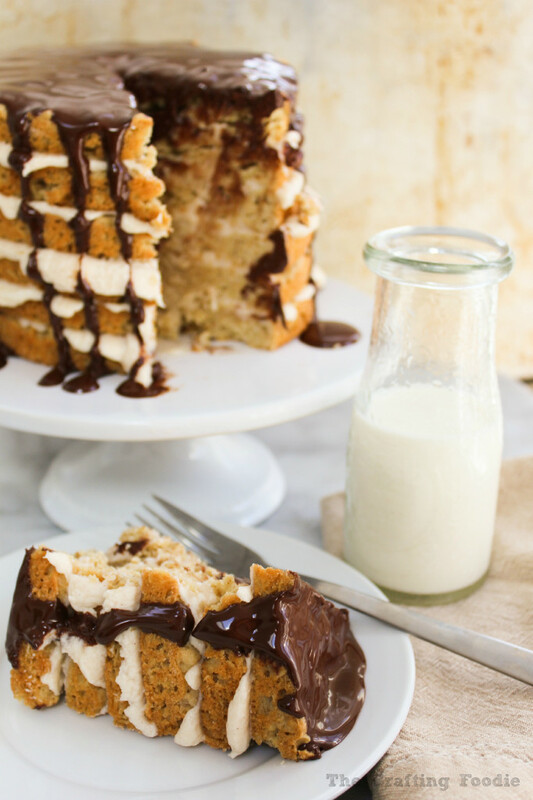 This gorgeous six-layered oatmeal cookie cake is filled with a light, fluffy cinnamon frosting and topped with a dark chocolate ganache. For the oatmeal cookie layers: Preheat the oven to 350 degrees F.
Line 3 6-inch circle baking pans with parchment paper and grease with butter. In the bowl of a mixer fitted with a paddle attachment, cream the butter. In the a medium bowl, mix the flour, salt, baking powder, and nutmeg together. With a wooden spoon, mix the dry ingredients into the butter mixture. Once combined, stir in the rolled oats. Working with 3 portions of dough, fill each of the three prepared pans. Pat the dough down to an even layer. Bake for 20 minutes. Do not over bake! The cookie layers need to be soft in order to cut into the cake. After the cookies cool in the pan for about 10 minutes, Turn the cookie layers onto a wire rack and allow them to cool completely. Clean and re-line and grease the cake pans. Cook the next 3 portions of cookie dough. While the cookie layers cool, make the frosting. Add the salt, cinnamon, and vanilla. Mix until incorporated. Add the milk, and beat until fluffy. Warm the cream until just simmering. Pour it over the chopped chocolate. Allow the mixture to sit for a minute or two. Mix with a spatula until the chocolate is completely melted and the ganache is smooth. Set the ganache aside to cool a bit while assembling the cake. Divide the frosting into five equal portions. Spread frosting over each layer as you stack the cake. Leave the top and and sides of the cake bare. Pour the warm ganache over the top of the cake. Happy Birthday, Sue! I can’t wait to see your sugar cookie birthday cake! And I’m honored that we’re on the same wave length. Maybe some of your creative cookie ideas can rub off on me! Wow! That sounds like such a simple yet ingenious idea. 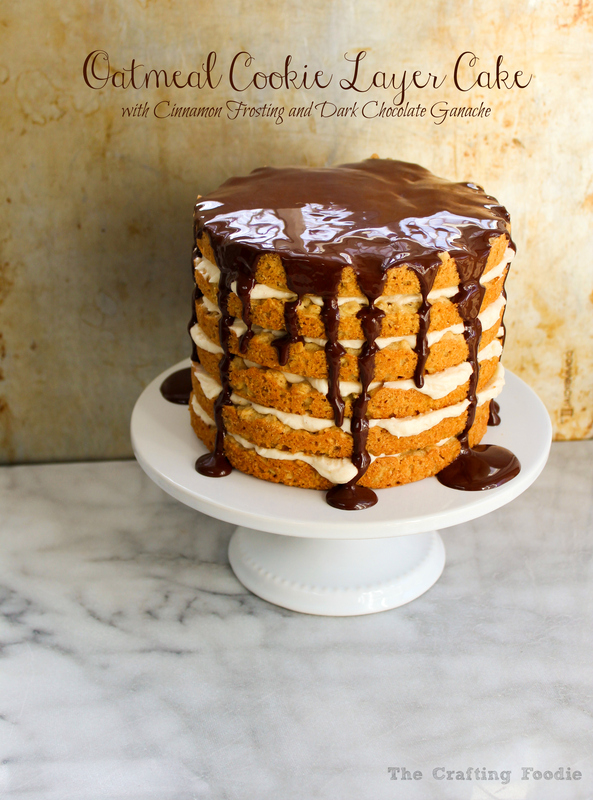 I love oatmeal cookies (no raisins please) and the idea of a layer cake… Yum. Pinned! Thanks so much Lucy! 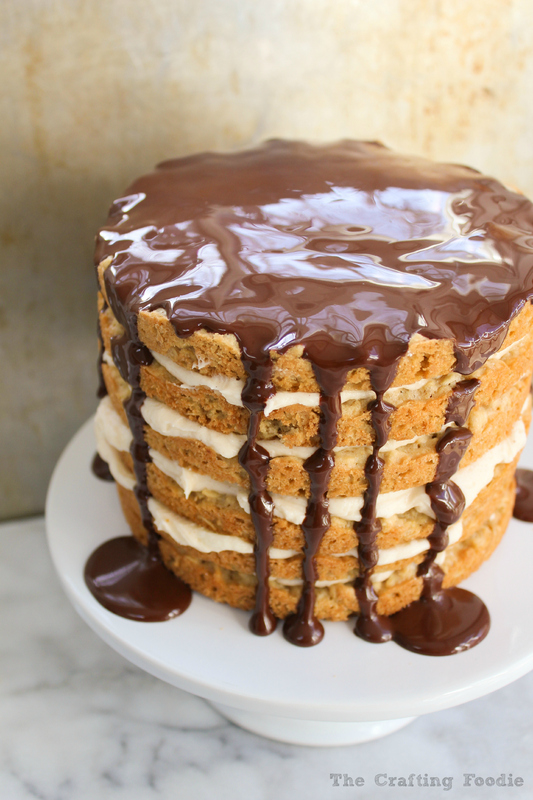 I know – why not make a cookie cake into a layered cake? It was so good. I wish there was some leftover because I want a piece right now! I love that you turned a humble cookie into a fancy layer cake! And the cinnamon frosting sounds fantastic with that rich ganache. What an incredible treat! What a great idea! I love oatmeal cookies, especially when they have chocolate in them, too. This cake is gorgeous and really unique, too. Stopping by from Totally Talented Tuesdays. A cookie that became a cake! And a very amazing cake! 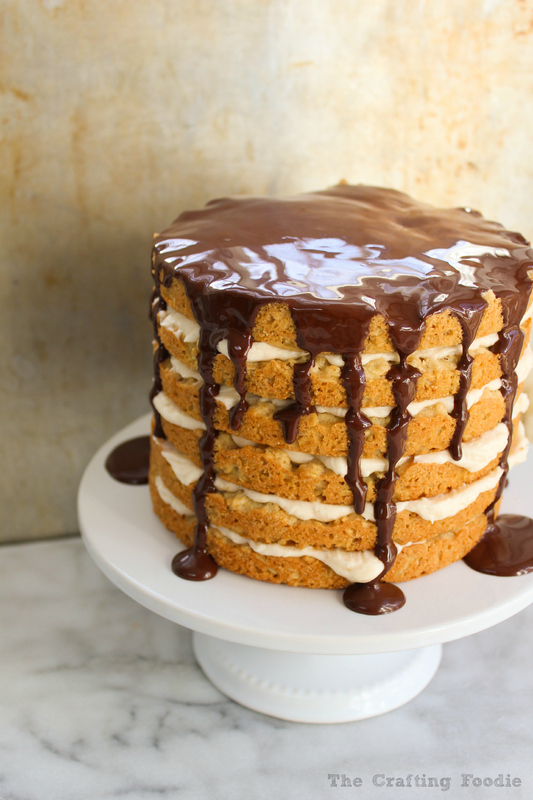 Wow this cookie cake looks awesome…the dripping chocolate ganache is so tempting..
What a gorgeous cake! Thanks for linking up with What’s Cookin’ Wednesday! This looks incredible! What a great idea for a cake. Thanks for linking up to the Project Parade. A brilliant idea and I love how you made this cake seasonal by using cinnamon and nutmeg. Pinned. Thanks for sharing this with us on Weekend Bites.